Another update! Perhaps this will hold some interest while waiting for help with the markings from the USS Intrepid Air, Sea and Space Museum. Once I get those, there's probably another 2, 3 hours before it's finished and I can send it off to the printer. Can you tell the difference between this one and the one in the prior post? However, this Hellcat promises to be one of my best yet. And still, time will reveal that there are parts to Harold's airplane that are plane wrong. Pun intended. But for now, I'm pleased and am hoping to be close to Malcomb Gladwell's "10,000 hour" mark. (Read Outliers). The picture below is Hamilton McWhorter, a Navy ace of 12 aerial victories. 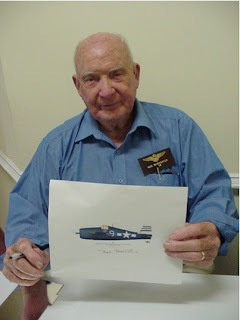 He's holding a hastily printed copy of my version of the Hellcat he flew from the USS Randolph in 1945. I did it in 2002 and frankly, the practice since then has improved my skill. To that point, last month, a Florida collector purchased the formal print and I spent a half hour making little touchups with a soft lead pencil! The collector was pleased but I sure wish I could do Mac's plane over. Practice may make perfect, but the time in between is corrupt. Mac died two years ago. There are some very cool things about this avocation and some very cruel as well. Wow! From pencil studies to nearly finished in five days - that's a record for me. This 'Cat is going back into the hanger until I get info on markings - hopefully in the next week or so. Then, I'll put them in, quite like the real process when a factory-fresh Hellcat obtained her squadron marks. Something to think about in the meantime - Harold is about 88 years old now. In the span of his life, he's experienced economic calamity and boom, world war, travel to outer space...and four BILLION people added to earth's current occupancy. I don't want to wax philosophical here - I do it badly anyway. But, in 1920, the earth's estimated population was 2 billion. Today, it's over 6 billion. What that means to us, at least to me, is this - soon the cumulative wisdom and energy of Harold's Generation will likely be absorbed into humanity and dissipated. Like steam. And it seems so...much like a waste. Today, Harold's son - a United States Senator - is tasked with representing his state in all issues of American policy, including the profoundly far-reaching issue of Social Security for the elderly. Politically, my views are unimportant. But I do believe in activism and I encourage my generation to become active in the Social Security issue by doing one thing - connect with them . Invite, engage, consult, but know that relationships with people who've already trodden our Roads Less Traveled is vital to the social fabric. On one hand, the above airplane is just a drawing. But on the other, it's an excuse to ask deeper questions, interpret the past and cast a clearer vision of the future. 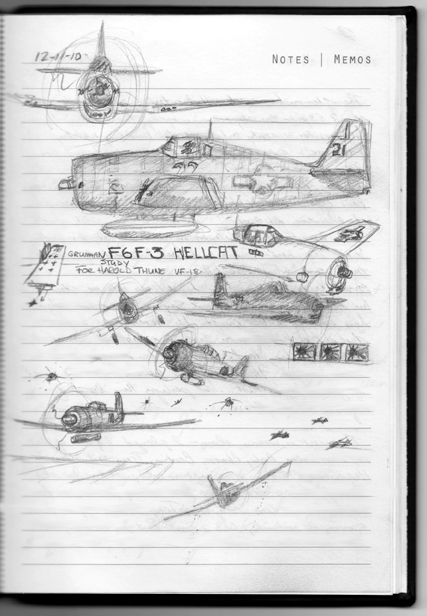 I decided to do Harold's -5 Hellcat, though still waiting for info on the markings. The cowl is grafted onto my pencil sketch for two reasons - one, I think it looks cool to see the pencil sketch come to life this way. Two, it shows how spot-on accurate my sketch was. Yahoo - the blind squirrel found a nut! (laughs). The dark blue is a wicked color, however. In real life, it was almost black. When working with such, there's an ever-present temptation to add excessive "weathering" details like chipped paint because of the difficulty in showing contour and texture. I'll refrain, however, for the simple reason that Navy planes typically didn't experience the visual wear & tear more common to ground-bound Marine and Army Air Force aircraft. I think artists and modelers tend to get a little too romantic with the hard-wear, but that's another topic. 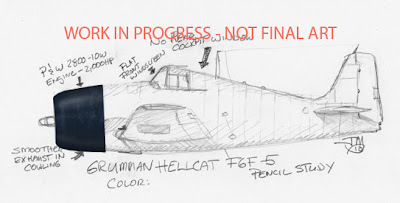 Thune's Hellcat will show a wee bit of sun-bleaching, maybe a chip or two, but for the most part, it'll represent the typical look of a hard working Navy fighter. However, the Pratt&Whitney R2800 engine did throw a bit of greasy exhaust and my next challenge will be managing the engine's 2000hp belches of smoke and oil. While waiting on some information on exactly which of Harold Thune's F6F to do, I decided to do the quick pencil study above to get into the Hellcat vibe. This one is a "-5" model - my notes are to contrast it with the -3 variant. Anyway, the sketch above took me, maybe, at most...three minutes. Just look - nothing to it! No complex curves, just straight lines and the flat face of a warehouse boxer. 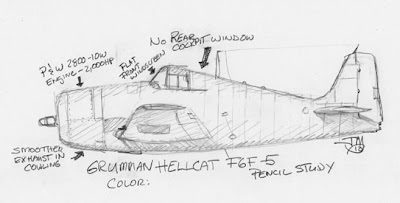 But, it also occurred to me that the features that made the Hellcat easy to sketch hinted at why the airplane was a brilliant business decision for Grumman and the U.S. Navy back in 1942. 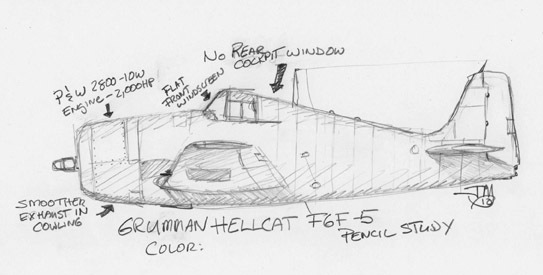 If you're an airplane geek, the Hellcat legend is fairly well known. It had the highest victory:loss ratio of any Naval fighter plane - 19:1. According to pilots, the F6F was gentle to fly, well armored, powerfully armed and almost as nimble as its main adversary, the lithe Mitsubishi A6M "Zero." I sat in one and was impressed with the roominess of the cockpit and good visibility in spite of the high-back fuselage. Back to those easy-to-draw points - in mass production, straight lines mean easier assembly, less complicated jig systems and rapidity of construction. To that point, I read that of the 12,000+ Hellcats built, 11,000 were built in the last two years of production. Grumman must have been pumping Hellcats out like water. By the time the assembly line shut down, the Hellcat was just under $40,000 a piece, making it the cheapest of the major American fighters in WW2. Today, Hellcats are scarce with only a handful or so flying. The last I heard, one of those are worth about $2-3 million dollars. The next post should show progress on Thune's specific airplane. Last month, I announced to my wife, "No more airplanes for a long while." Funny how things work because the ears of Fate must have remembered a comment I made to Steve Heffernan, a historian at the Naval Air Museum in Pensacola, FL. Steve's a native South Dakotan and rightfully proud of his home-state's representation in Washington D.C., Senator John Thune. 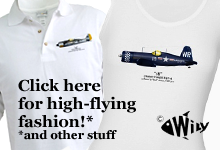 He and I were standing in the Naval Air Museum's expansive, Indiana-Jones like warehouse when he pointed to a city-block long rack of cardboard boxes filled with WW2 flight records and announced, "Have you done Thune's dad's Hellcat? His flight records are up there somewhere..."
I replied, "No. Should I?" Steve gave me a "Duh!" look and commanded, "Yes, you should!" Unfortunately, in the blur of the moment (I WAS in one of the Nirvana's of aviation archeology, so things were rather distracting), I forgot my promise shortly afterwards. 11 months later, a newspaper called to get some insight into the 69th Anniversary of Pearl Harbor (why they asked ME, I have no freaking idea) and the reporter asked, "Have you met Senator John Thune's dad, Harold?" Blink! I remembered my promise and admitted such to the reporter who promptly got me in touch with Thune's office. One week later, I'm meeting with the Senator's aides, discussing how to get the elder's records to accurately reproduce Harold's Cat. 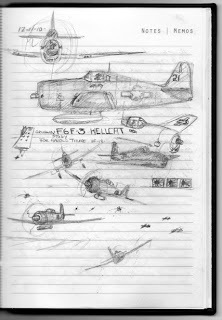 And so, I've begun the project of capturing the F6F flown by Lt. Harold Thune of VF-18 (Intrepid). The scan above is my pencil sketch study I made this weekend while snowbound during a camping trip. The Senator's office and I are researching the airplane that Harold flew during a fateful mission in Fall of 1944 where Harold downed 4 Japanese airplanes. Watch this space - it promises to be a cool story, with lots of interesting details that you wouldn't normally get to see. I guess I spoke too soon about "laying off the airplanes."